This pin was offered at WDW resorts when you booked a vacation package using the Flex feature, but apparently was also available in the WDW resorts' gift shops. It was never sold inside the parks, but could be easily found on Cast Member lanyards. The design was originally supposed to be the logo for the millennium celebration. This is the 2004 Kodak GWP pin available at WDW with the purchase of Kodak products. 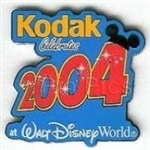 "Kodak celebrates 2004 at Walt Disney World." The number 4 has a set of Mickey Mouse ears. This pin is only available by purchasing a 2 pack of Kodak cameras at Disney World Theme Parks. Rectanglular pin with black background, 2000 logo, yellow and red dancers with ribbons over their heads. At the bottom are the words "Walt Disney World ® Resort in Florida" and "Celebrate the Future Hand in Hand." Tinker Bell is peeking out of the left side of this teal colored calendar for February 2002. This pin features a red and white star with the number 12 in front. The one is yellow, and the two is red with yellow buttons. There is a Mickey Mouse ear hat on the number 2. Mickey is dressed as a pilgrim carrying a basket of vegetables. The basket has "2002" written on it and there is an orange banner with the word "Thanksgiving." WDW 2000 logo; Donald Duck, Mickey Mouse, Goofy poking through the zeros in the 2000 logo. A black background with a Yellow 2, a blue 0, a green 0 and another blue 0. "Walt Disney World"(R); "Celebrate the Future Hand in Hand" is written along the bottom. Center for Living Well Family Healthcare - Grand Opening 2008. Pin was given out after you completed a tour of the new Health Care facility during the 3 day "Open Mouse". Minnie Mouse is featured on this dated 2007 pin - Minnie's head and face are shown with the numbers "07" in yellow and red, respectively. This pin is part of set 67784. It features Donald wih his left hand out standing in front of the numbers 2009. The pin is 1 1/4" wide and 3/4" tall. This pin features a white star with 2009 in the middle and is part of the Varsity Icons Mystery Pouch pin collection. This listing is for the Donald Duck Pin ONLY from the 2013 Mini-Pin set (#93918). This pin features Donald behind a red circle with a 13 in the middle. The word Twenty is above the number thirteen. This listing is for the Dale Pin ONLY from the 2013 Mini-Pin set (#93918). This pin features Dale behind a purple circle with a 13 in the middle. The word Twenty is above the number thirteen. Size is 1-1/4" tall x 13/16" wide. Round pin. Mickey ears in black on a red background. 2000 in Blue Text in gold. This listing is for the Chip Pin ONLY from the 2013 Mini-Pin set (#93918). Commemorate your 2013 visit to Walt Disney World® Resort with this open edition pin featuring Goofy, Donald Duck, Minnie Mouse, and Sorcerer Mickey Mouse. Behind the fab 4 is a blue burst with stars around. At the bottom of the pin is the Walt Disney World Resort logo. This listing is for the Chip Pin ONLY from the Dated 2013 Mystery set (#93928). This pin was given to Disneyland cast members who worked New Year's Day 2001. It's a round pin. The outside is a white rim with 2001 (which extends past the edge of the pin) and Happy New Year. he center is navy blue with gold silhouettes of Mickey Mouse, Minnie, Goofy and Donald Duck surrounded by confetti and fireworks. Mickey's white gloved arm holding a yellow wand with a Star tip and surrounded by multiple yellow stars over EPCOT's Spaceship Earth; "Walt Disney World" in red through the center of the pin "2000" in red at the top and surrounded by yellow stars from the wand. Donald Duck is featured on this dated 2007 pin - Donald's head and face are shown with the numbers "07" in yellow and red, respectively. This pin features a blue star with 2009 in the middle and is part of the Varsity Icons Mystery Pouch pin collection. This pin features Figment on a 2015 dated pin similar to others such as #106834 (Stitch/Disneyland). The pin-on-pin element has Figment (head and neck only) and \"2015\" in front of a stylized castle and clouds. A yellow flag flies over the castle with \"Walt Disney World\" on it, and there are fireworks to the right of the castle.. The pin is silver-finished; it has the Mickey head waffle pattern on the back. There are three boxes on the back: 2014 ODPT logo, © DISNEY / MADE IN CHINA, and \"N556-6633-4-14150\". There is one post/back on the pin, and it is 1-3/4\" wide by 1-11/16\" high. It comes on a blue backer card with \"2015\" (same font as on the pin), stars, and Mickey heads. Overall Pin background is white with a red colored oval, on top of that the MGM 2000 logo in white, a standing Mickey Mouse silhouette. In blue MGM city skyline background and the words "Disney MGM Studios" in silver just below the MGM 2000 Logo and "On With The Show!" at the very bottom of the pin in red lettering. WDW Spring Break 2001. This pin is a LE of 5000 and was released property wide on 3/22/01. The artist Mark Seppala was at DTD during the Pin Event to sign the pin that he designed. The pin has the silhoutte of Mickey Mouse at the top with the words Spring Break 2001 underneath. White Square with artistic blue Cinderella's Castle. 2000 Logo, Walt Disney World in Blue writing, Magic Kingdom in Red, Cast Summer Celebration in yellow, dark bluish, purple background. This listing is for ONLY the "0" pin featuring an orange and black Tiger print design. It is from set #4467 - Animal Kingdom Year 2000 4-pin set from Walt Disney World. Pin is 11/16"" tall and 11/16" wide. This limited edition pin released at WDW commemorates Presidents' Day. It features a black, white and grey Mickey as Washington, Pluto as Jefferson, Donald as Roosevelt, and Goofy as Lincoln sculptured in "rock" similar to the real Presidents from Mount Rushmore. The bottom of the pin reads Presidents' Day in red and white and 03 in gray. This pin features the Disney characters on a spinner. Goofy, Donald Duck, Minnie Mouse, and Mickey Mouse are featured with park icons: Spaceship Earth (Epcot), Tree of Life (Animal Kingdom), Sorcerer's Hat (Disney Hollywood Studios), and Cinderella Castle (Magic Kingdom). This pin was released on Jan 19th 2001 in Tokyo Disneyland. Mickey Mouse appears with a hat and cane. The Sorcerer's Apprentice is featured in front of Cinderella Castle at the Walt Disney World® Resort in this Open Edition pin. This dated 2008 pin features pin on pin and glitter elements. This pin has the castle in dark blue in the background with 2002 in front of it - the "2" is red, the "0" is yellow, the "0" is blue and the last "2" is green. Mickey in originial clothing is raised and standing in front of the 2002 and "Disneyland" dangles below the pin. It's a very cool looking pin! This is a 4-pin set that spells out "2000" in numbers that are painted with animal prints. the "2" is orange & black,as a tiger. The "0" under it,is black & white. The next "0" is black & white as a zebra. The "0",next to the "2" is brown & white,as a giraffe. This Disneyland® Resort Annual Passholder exclusive limited edition pin is number 1 of 4 in a series and features Tinker Bell flying over Mickey's Fun Wheel. It is the pie wedge shaped upper right quadrant of a circle when all four pins in this series are assembled. Tinker Bell's wings feature sparkle glitter paint. On the outer edge is a green border with flowers representing Spring behind Tinker Bell's wings.